On Sunday, Prime Minister Narendra Modi will roll out the Pradhan Mantri Jan Arogya Yojana (PMJAY), which will provide an annual health cover of Rs 5 lakh for 50 crore people in 26 states. LEANING BACK on a steel chair at City Care Hospital in Nuh, Mohammed Haneef is patiently waiting for a doctor to treat his “throat pain”, unsure of what the bill will finally add up to. The 40-year-old farmer from Ghasera in Mewat doesn’t know it yet. But in a few months, the bill will no longer be a concern — if City Care’s application to be empanelled on the list of private hospitals for the world’s largest government health insurance programme is cleared. On Sunday, Prime Minister Narendra Modi will roll out the Pradhan Mantri Jan Arogya Yojana (PMJAY), which will provide an annual health cover of Rs 5 lakh for 50 crore people in 26 states. In Haryana’s Mewat (Nuh), India’s most backward district, two government hospitals will join the national rollout. But it’s the number of private hospitals on the list that’s got health officials worried: zero. This is mainly because of the lack of hospitals that can meet the “strict” empanelment criteria (see box), officials and owners across the district told The Indian Express. Most private hospitals are 5-6 bed facilities, they say, and people prefer to visit neighbourhood healers, or “quacks”, when it comes to most minor ailments. “Of the 8,012 hospitals that have been empanelled across the country ahead of the launch on September 23, about 50 per cent are in the private sector. About 20,000 applications have been received so far,” says Dr Dinesh Arora, Deputy CEO, National Health Agency (NHA), which is in charge of implementing PMJAY. “In Haryana, 122 private hospitals have qualified for reimbursement of hospitalisation, drugs and diagnostic costs under the scheme, but none in Mewat. The empanelment criteria are strict, it’s difficult to find a hospital in Mewat that meets all of them. Most of the private doctors here are quacks,” says Dr Renu Sharma, district nodal officer for PMJAY. Over the last few weeks, Sharma has been criss-crossing the district to inform hospital owners about the scheme and urge them to try and make the cut. For private hospitals, this means putting in place a range of 24X7 services, and meeting stringent norms regarding the availability of specialists, and staff and equipment for disciplines such as neurosurgery, paediatrics etc. “I also called them to my office (at the Al Afia district hospital) and held a meeting,” says Sharma. One of those who attended this meeting last week was Dr Amzad Ali Khan, a neurophysician who owns City Care “with 15 beds and an average monthly occupancy of about 80 per cent”. “We were empanelled for the Rashtriya Swasthya Bima Yojana (RSBY), and are keen to join PMJAY. I went online and filled all the forms. I have also downloaded the empanelment criteria and hope to be able to meet them soon. I only hope the payments are not delayed. For RSBY, we still have about Rs 1-1.5 lakh pending,” he says, referring to the government scheme launched in 2008 that provided an annual health cover of Rs 30,000 to families of migrant workers. 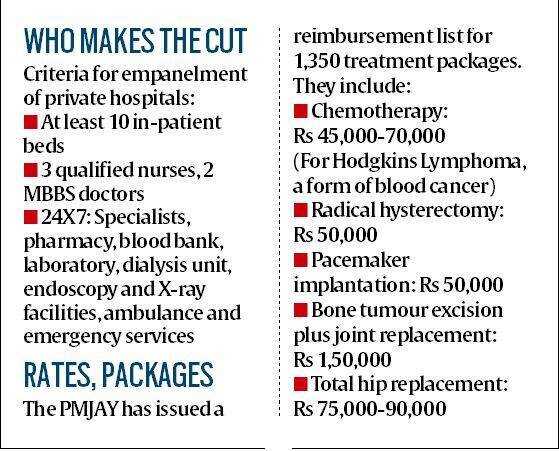 “Do you know where I can get the list of 1,350 treatment packages that are eligible for reimbursement under PMJAY. and the approved rates?” asks Khan. The list is available on abnhpm.gov.in, the online face of the scheme. As The Indian Express reported Friday, 4.58 lakh people or around 57,370 families out of a total population of 11 lakh are eligible for PMJAY in Mewat. The beneficiaries, identified from the Socio Economic Caste Census (SECC) 2011, get “gold cards”, which entitle them to reimbursements for bed charges, and drugs and diagnostics two days before, during, and 15 days after hospitalisation. City Care, Khan says, has several consultants, including an ENT specialist, a general surgeon, a physician and an Ayurvedic doctor. “But we do not conduct any obstetric or gynaecological procedures, which is common in Mewat where the average family size is about eight,” he says. Unlike some of the bigger hospital chains that have complained to officials about the reimbursement rates (see box), Khan scans the list and reveals that he will enjoy a price advantage. “For example, we charge Rs 16,000-20,000 for a cholecystectomy (gall bladder removal), while the PMJAY rate chart allows us to charge Rs 22,000,” he says. There are also incentives on prescribed rates for quality certification, says Arora, the NHA Deputy CEO – 10 per cent for entry level and 15 per cent for full certification by National Accreditation Board for Hospitals & Healthcare Providers (NABH), 10 per cent for facilities in rural areas, 10 per cent for hospitals with teaching facility, etc. However, unlike Khan, some of the others who attended the meeting with the district nodal officer did not have much to look forward to. “I was there at the meeting but we can’t make the cut because of the number of beds. only five. Anyway, our charges are nominal. We don’t have any bed fees. We charge Rs 200-250 for a bottle of glucose and Rs 50-70 for an injection. All drugs are sold at MRP. We want to be a part of the scheme but the requirements are very stringent. If they relax them, it would be good,” says Mohammed Zaid, who runs Momin Hospital, less than 5 km from Sharma’s office. Behind the “nominal” charges is a simple business model — patients are directed to buy drugs and consumables from the pharmacy next door run by Zaid’s brother. Also Read | What is Ayushman Bharat scheme? Near City Care, two Ayurvedic doctors are in charge of Murad Hospital, which specialises in obstetrics and gynaecology. “We have 10 beds and around 80 per cent occupancy. We sent somebody for the meeting with Dr Sharma but the conditions are very stringent,” says Dr Rubina Khan, who runs the facility with her brother-in-law. “The presence of at least two MBBS doctors is mandatory and caesarean sections will not be reimbursed in private hospitals. Also, we need to have an ICU, 24/7 specialists. where will we get all that from?” she asks.